Boba Fett, the most feared, most respected, and most loved bounty hunter in the galaxy, now has all of his comics stories collected into one massive volume! In these stories, Boba Fett gets caught between the Rebellion and the Empire; seeks a mysterious relic from a wrecked Star Destroyer; settles a diplomatic dispute -- with extreme prejudice; takes part in a bounty-hunter free-for-all; fights Darth Vader; and even goes up against a Boba Fett impostor! There's no job too deadly for the man in Mandalorian armor! * A complete collection of Boba Fett tales! * Boba Fett encounters Darth Vader, Han Solo, and . . . another Boba Fett? * The Dark Horse Star Wars Omnibus series gives you over 400 big pages for only $24.99! 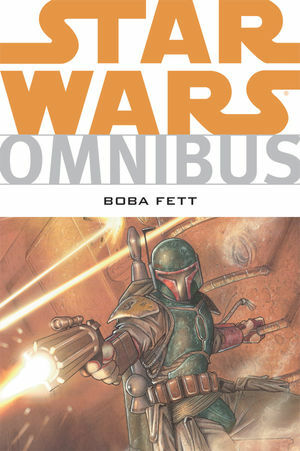 FC, 496 pages, TPB, 6" x 9"
Star Wars Omnibus: Boba Fett is not currently available from Things From Another World.If you're interested in locating this product, please consider contacting a registered comic shop or retailer near you. Entire contents trademarked (® or ™) and copyrighted (©) 1986-2014 by Dark Horse Comics Inc. and its respective Licensors. Dark Horse, Dark Horse Comics, and the Dark Horse logo are trademarks of Dark Horse Comics, Inc., registered in various categories and countires.